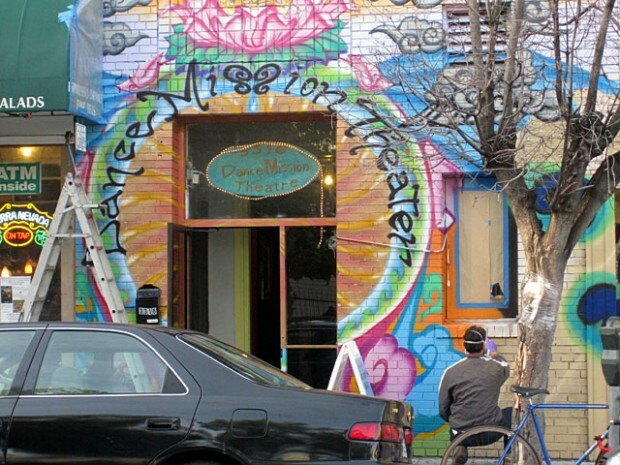 Dance Mission Theater. Photo by Lydia Chavez. Stepping out of the BART at 24th and Mission at most hours of the day one is likely to hear the pulse of African drums, hip hop, or salsa emanating from the second floor studios of Dance Brigade’s Dance Mission Theater. But that music may not continue forever. The performance space and dance school announced that its landlord is seeking a rent increase which may make it a struggle for the non-profit to continue operations in the coming year. The non-profit is reaching out to its fans and supporters to raise $60,000 so it can afford to stay in the space it’s occupied since 1998 without raising the cost of its classes or facility rental. Artistic director Krissy Keefer says that the organization has had the same landlord, 24th/Mission Partners, since it first moved in, and while the rent has gone up steadily over the years, news of the latest increase and the limited lease felt like a shock. Keefer says that the relationship with her landlord has been mostly fine and hopes they can work something out. She also says that Dance Mission Theater is working with the San Francisco Arts Commission’s rent mitigation program to help stave off displacement. Dance Mission Theater hosts roughly 1,500 students a week, Keefer estimates, and offers above 48 weeks of live performances throughout the year. That overlapping communities could prove useful in the arts organization’s survival. Keefer says in the first seven days of its fundraiser, Dance Mission Theater has already collected $10,000 in donations. Laura Wenus contributed reporting to this story. Daniel Hirsch is a freelance writer who has been living in the Mission since 2009. When he's not contributing to Mission Local, he's writing plays, working as an extra for HBO, and/or walking to the top of Bernal Hill.